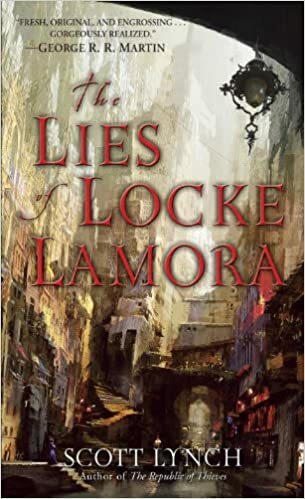 The Lies of Locke Lamora by Scott Lynch is an engaging fantasy novel set in the city-state of Camorr, which is inspired by Venice. Locke is a leader of a gang called the Gentleman Bastards who steal from the nobility and other marks using elaborate confidence schemes. The novel spends a lot of time uncovering the history of the Gentleman Bastards, and delving into the underground of Camorr. This is presented in an engaging manor, but my favorite part of the novel is the way in which Scott Lynch constructs the world Locke operates in. At no point does it feel unnatural. Since, Locke has to have a deep understanding of the world around him the world naturally materializes around him to provide ammo for his impressive heists. The human civilization of Camorr is built on top of a long gone alien civilization, which had a much higher level of technology (and maybe magic). It subtly sits in the background, but begs the question: When we fade will a new civilization use what we have left behind for their infrastructure? History seems to point to yes, if it is still usable and someone understands how to use it. It is easier to adapt what is present and use it as a natural resource than to tear it down. And those who can use the technology become the priests, witchdoctors and magicians of a new world… Treating what those long gone took for granted as gods. Despite the awesome world building, fun dialog and nail biting plot the novel can feel like a Dungeons and Dragons campaign at points. Certain events and encounters feel like they are triggered by status effects, or dice rolls rather than the narrative. This never makes the story feel forced, but sometimes it feels like you are on a side-quest/or a search for a magic potion. There are also a few encounters which just feel weak and are not well worked into the story. The Lies of Locke Lamora is a fun and enjoyable fantasy book with awesome world building, and for that alone I think it is worth while if you want a fun and interesting fantasy novel.